: The Auvergne pointer is a very ancient breed, present in the Cantal region for more than two centuries. Descending from a multi-pointer common source, derivation has been made by a selection to which the Knights of Malta might have participated. Created by and for hunters, it has a strong identity reinforced by its coat. : Rectilinear, of medium proportions. 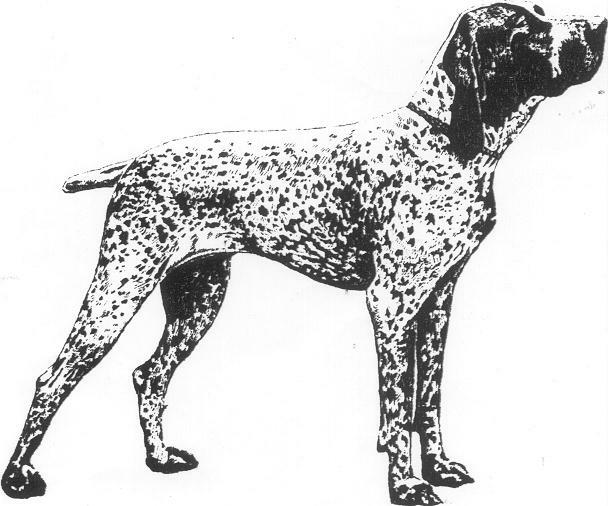 Robust dog, strongly boned, but without heaviness, showing a characteristic Braque type, lightness in its gait, with elegance enhanced by the coat and harmonious proportions. Its conformation predisposes it to cover long distances with a supple-action, permitting it to maintain its activity the whole day on the most difficult terrains. Body: The length of the body (from the point of the shoulder to the point of the buttock) is approximately equal to the height at the withers. The depth of the chest equals half the height of the dog at the withers. Head: Length of the muzzle slightly less or equal to the length of the skull. : Gentle dog, very affectionate, intelligent and obedient. Its training consists mainly of developing its natural qualities. Its sense of smell is powerful. It adapts well to family life. : The head is long, proportional to the size, somewhat lighter with the females. : The lines of the skull are slightly divergent towards the front (a characterized braque). Seen from above, the shape of the skull is nearly oval. The occipital protuberance is only slightly prominent. The skull width between the zygomatic arches is equal to its length. Superciliary arches: Well pronounced. : Always black, relatively broad, shiny, with well-open nostrils. Its upper profile is in prolongation of that of the muzzle. : Length close to that of the skull. The muzzle is level. : Relatively important. The upper lip overlaps the lower. Neat commissure, without important inner fold. Seen from the front, the lips form a square end to the muzzle. : Sturdy, of equal length. The teeth are strong. Scissors bite or level bite. : Relatively large, oval, of dark hazel colour, well set in the orbit, giving an expressive candid and kind look. The well pigmented eyelid does not allow the conjunctiva to be seen. : Attached rather towards the rear. At rest, the ear is set below a line running from the upper level of the nose to the eye. When attentive, the ear may move up to that line. Turned slightly inward, neither curled nor flat, the ear is supple and slightly satiny. : Relatively long, well inserted between the shoulders, slightly arched. Presence of a slight dewlap. The length of the neck is roughly equal to that of the head. : Narrow, flat and short. The spinal column isn’t sprung out. : Well attached, wide (especially in females), very slightly convex. : Oblique (35° with respect to the dorsal line), points of hips visible. : Long and deep, reaching elbow level. A transversal section is egg shaped, regularly sprung, without rupture in the lower part. : Rises gently towards the belly, not whippety. The flank is wide, only slightly hollowed, joined smoothly to the hips. : Set rather high. It should be carried horizontally. Cylindrical and not too fine. Docked, it has a length of 15 to 20 cm (6” to 8”). Undocked, it reaches the point of the hocks without going further. : They are in line with the body. : Upright to the ground. : Strong, well muscled, quite free in action. Sloping at 45°. : Well in the axis of the body. : Strong and long, muscular and straight. : Short, slightly inclined seen in profile. : A little longer than what’s called a « cat food » and a little shorter than a « hare foot ». Turned neither inward nor outward. The nails are strong and short; the pads are hard and resistant; the toes are tightly knit. : Well angled, they work in parallel planes. : Lean and well defined. : Short and never too thin. : Movement of average amplitude but with a sustained rhythm which confers its notorious endurance to the dog. Its habitual hunting gait is an average gallop, regular and slightly rocking. : Fine enough, rather loose without exaggeration. : Short, not too fine, never hard, shiny. Black with white markings of variable importance. The particularity of the marking generates two recognized types Flecked or Greying. This difference cannot be used to separate two subjects of the same quality. The head should be black preferably with a white blaze on the muzzle extending to the skull. The white of that blaze can extend laterally on the muzzle. A white and flecked ear or the side of the head white and flecked cannot be considered as faults. Males 57 to 63 cm (22.5" to 24.8") (60 cm – 23.6" – ideal height). Females 53 to 59 cm (20.9" to 23.2") (56 cm – 22 " – ideal height). Parallel lines of skull and muzzle. Head too loaded under the eyes. Convergent lines of muzzle and skull (towards the front). Ear attached too high, too short, flat, too much corkscrew. Lips hanging or floppy, too short, muzzle tapering towards the end. Character: Aggressive or overly shy. Head: Lack of “braque”type. Undershot or overshot with more than 1mm gap between the incisive arcades. Lack of first premolars is tolerated. The lack of 2 other premolars (PM2 or PM3) or of any other tooth including PM4 is eliminatory. Eversion or inversion of eyelids or traces of corrective intervention. Legs: Presence of dewclaws or traces of their removal. Coat: Entirely black or entirely white. Absence of flecking. Tawny marks or “burnt bread” (fawn) glints. Dudley nose. Unpigmented eyerims. Yellow eye (said “hawk eye”). Wall eyes.